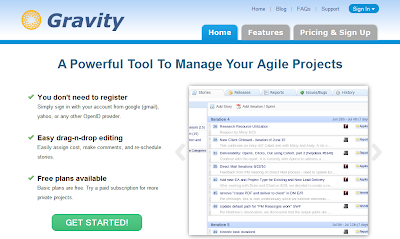 Gravity is a powerful tool to manage Agile Projects. The plus point of this tool is its simple and clean interface. No need to registration, simply sign in with your Google, Yahoo, or openid account. All accounts are secured by SSL. By using its Develope API, easily integrate Gravity into your existing tools. Gravity is free for user accounts with some limitations. You can create one private project and 5 private participants. But you can create as many as public projects and participants.